The cervical sympathetic chain is composed of superior, middle and inferior cervical ganglia. Often, the inferior cervical ganglion is fused with the first thoracic ganglion, forming the stellate ganglion. It is usually located in front of the neck of the first rib and extends to the interspace between the seventh cervical (C7) and first thoracic (T1) vertebral bodies (2, 8-10). It may rest on the anterior tubercle of C7 when it is elongated. If the inferior cervical ganglion and first thoracic ganglion are not fused, the inferior cervical ganglion lies in front of the C7 tubercle and the first thoracic ganglion rests over the neck of the first rib. The stellate ganglion lies medial to the scalene muscles, lateral to the longus colli muscle, anterior to the transverse processes and prevertebral fascia, and superior to the subclavian artery and the posterior aspect of the pleura. The initial portion of the vertebral artery lies anterior to the stellate ganglion. Preganglionic sympathetic fibers originate from cell bodies in the anterolateral column of the spinal cord. Nerves supplying the head and neck arise from the first and second thoracic spinal segments. Fibers destined to the upper extremities are traceable from the second through the ninth thoracic segments (T2–T9). The preganglionic axons leave the T1 and T2 ventral roots, pass through the white rami communicans, join the sympathetic chain, and ultimately synapse at the inferior (stellate), middle, or superior cervical ganglion. Postganglionic sympathetic fibers pass the gray rami and join the cervical or upper cervical plexus. Most of the sympathetic fibers for the head and neck travel along the common and then internal or external carotid artery. Some of the fibers, however, leave the stellate ganglion, form the vertebral plexus and innervate cranial structures supplied by the vertebral plexus. Thus, blockade of the sympathetic innervations of the head and neck must incorporate inclusion of the stellate ganglion. Pain syndromes: Complex regional pain syndromes (CRPSs) type I (reflex sympathetic dystrophy [RDS]) and type II (causalgia), craniofacial hyperhidrosis, meniere triad, refractory angina, phantom limb pain, herpes zoster, and pain of the head and neck. Differential diagnosis: Stellate ganglion block differentiates sympathetically mediated pain from somatic pain of the head, neck and upper extremity. Arterial vascular insufficiency: Raynaud syndrome, scleroderma, obliterative vascular diseases, vasospasm, trauma and emboli. Other possible indications: hot flushes ?, post traumatic stress disorder (PTSD) ? Procedure can be done by either palpating anatomical landmarks or under fluoroscopic, ultrasound or CT guidance. Complications include pneumothorax, bleeding, infection, allergic reaction, intravascular injection and its consequences, phrenic nerve or recurrent laryngeal nerve palsy, hypotension, injury to adjacent vascular structures (particularly the vertebral artery) and bradycardia. A successful stellate ganglion block may result in a Horner’s Syndrome on the involved side. This consists of: pupil constriction(decrease in size), hot red face, anihidrosis, red eye and drooping eyelid. The Horner’s syndrome will normally dissipate in four to six hours after the block. The mechanism of action of the stellate ganglion block is not completely understood, but has been described as involving peripheral vasodilatation, resulting from the neural inhibition in the ganglion’s sphere of innervation. However, the wide ranges of conditions that are known to respond favorably to stellate ganglion block suggest that its effectiveness may involve a far more complicated mechanism of action than a transient increase in blood flow. Reports about treatment of PTSD and hot flushes cannot be explained by the conventional explanation of the effect of SGB. In the course of mapping the sympathetic nervous system to the related regions of the cerebral cortex, Westerhaus and Loewy used pseudorabies virus injections to identify connections of the stellate ganglion. Pseudorabies virus allows identification of neural pathway connections that are 2–3 synapses from the point of injection of the virus. In this manner, the use of pseudorabies virus injection is used to identify cortical areas connected to the stellate ganglion. The stellate ganglion has shown to have second and third order neurons that connect with hypothalamus, amygdala, infralimbic, insular and ventromedial temporal cortical regions. These data provides objective, anatomical support for the stellate ganglion interaction with several key structures known to modulate core body temperature, CRPS and PTSD. The unifying explanation is the change in nerve growth factor eventually leading to an increase in brain norepinephrine (NR) and finally leading to pathologic states, with the SGB reducing the concentration of both NGF and NR and deactivating intracerebralpathologic states. Nerve growth factor (NGF) is the best characterized member of the neurotrophin family, which is involved in a variety of signaling events such as cell differentiation and survival, growth cessation and apoptosis of neurons. Its levels have been evaluated and seem to change with the conditions discussed. 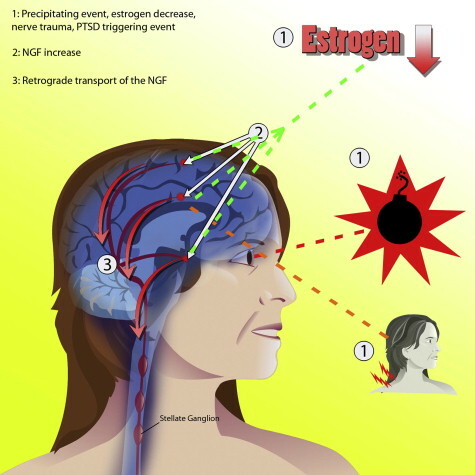 Studies indicate that estrogen reduces NGF protein content in sympathetic vascular targets. NGF levels are known to increase with chronic stress. NGF is also known to elevate immediately prior to the first parachute jump, thus demonstrating a NGF connection with stress and possibly PTSD. Anti-NGF antibodies can reduce CRPS symptoms. In addition, NGF administration can lead to hyperesthesia. Sprouting further leads to increased norepinephrine (NE). 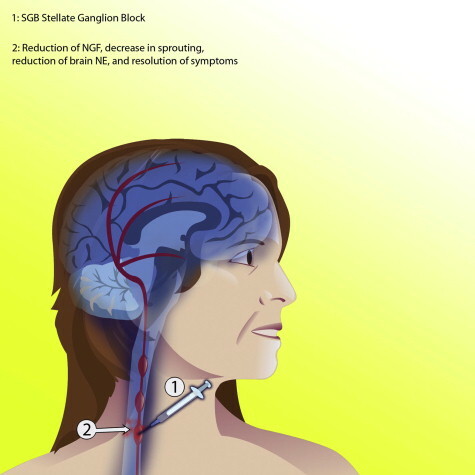 Brain infusion of NGF in rats leads to NE increase. Direct evidence that NE is involved in hot flashes, CRPS and PTSD can be found in the literature. Local anesthetic application to the stellate ganglion nerve tissue reduces NGF that is essential for maintenance of sprouting. 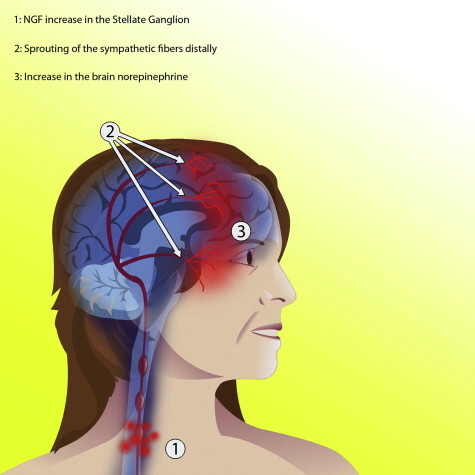 The NGF decrease leads to dying of new nerve outgrowth and sprouting.